Size: Tusk is 4.5 feet along curve! This is a very collectible Mammoth tusk fossil. It is a large, complete tusk from the Wooly Mammoth, Mammuthus primigenius. This specimen is from the same area that was featured in the Discovery Channel special, ''Raising the Mammoth''. 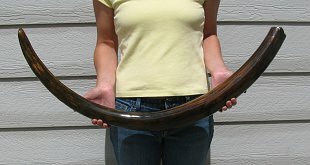 This tusk is from an adult, meaning the Mammoth was fully grown when it died. The large tusk is complete down to the very tip, and the root end is intact and hollow. The shabby outer covering of the tusk, or ''bark'', has been polished off to expose the striking color of the fossil ivory. The tusk is very heavy and solid, meaning the value of the fossil ivory in the tusk is quite substantial. And at four and a half feet long, it is easily the longest Mammoth tusk we have ever had. As an added bonus, this specimen comes with a sample of real Wooly Mammoth hair (''Wool'') at no extra charge! This is a very large Mammoth tusk that simply displays beautifully.